that's me *finally* below 11 stone, hurrah!! So, the play is now over... it was a roaring success and we've all had loads of compliments. I'm chuffed to pieces about how well it went, but not about the bloody p*ssing rain on saturday, grrr... such a shame as that was the night that Joe, his parents, and my son all came to see me perform! I had a lot of fun and, although slightly relieved that it's over and really ready for my bed tonight, I feel somewhat bereft. I thoroughly enjoyed working with all the cast and crew... we were like a little family in the end, it's so sad it's all over! anyway, now I can spend the week training and preparing for our trip to France. to be honest I've been somewhat dreading the time away as Joe has expressly forbidden me to take any dumbbells with me (I think he'd probably cotton on if I did sneakily as they would somewhat add to the weight of my bag!! ), and there's no gym at the hotel we're staying at... I've been panicking! So, instead of getting in a total tizzy I decided to use all the time spent not on stage (basically the entire 2nd half of the show!) going through all my strength training books and copies of Muscle & Fitness and Ultra Fit. This exercise was caught on camera, ha! 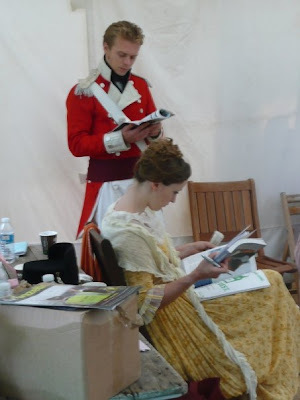 Here's me in our changing tent with said magazines/books and with a Mr Wickham standing on behind. So... I haven't yet finalised all the activities I can do... I'm going to take my running shoes and skipping rope with me and there are the obvious strength exercises I can do like press-ups, bench dips, back extensions, crunches etc - I have decided that I'm going to concentrate on my stomach big style as I've been neglecting it of late. I also wondered if I could sneak a stability ball into my bag. Joe's got one already, but it's pretty heavy duty so I might buy this one from argos. I *really* want to get this Nike Resistance Band Kit, but none of the Argos' in London seem to sell it, arghh! I'll keep my fingers crossed that it comes back in stock between now and Thursday. A lot of the exercises I saw that I could do without weights involved resistance bands, and these look perfect! In terms of training last week... despite the huge number of rehearsals and then the actual performances from Thursday onwards - I actually did quite well :-) I managed to almost entirely stick to my plan, the only deviance being on Friday when I ran out of time and had to just do my lower leg workout. Was quite pleased though to be able to whizz through it, with 80kg on the leg press (I would try more but I don't think I could push myself out to begin with!! ), 55kg on adductor and abductor and up to 40kg on the leg curl and extension (I didn't have time for single leg presses :-( ). So yeah, I didn't get the chance to go for my run... I optimistically took my running shoes with me to my company's country club (where I was staying and the performance was taking place) but the run didn't happen. Not going to beat myself up about it though as managed really well with everything else considering how much I had on! food-wise it wasn't great. I didn't eat a hot meal until Saturday! And that was steak and chips followed by apple crumble and custard, OMG it was awesome, and so needed! I'd had a week of eating the bare minimum snacks that were provided for me... and only managing to not overindulge on the crisps, chocolates and sandwiches because I took my maximuscle promax diet bars and maxi-milks with me (maxi milk is great because you don't need to fridge it, but the chocolate doesn't taste as nice if it's not very cold, probably because it's thicker in consistency to other protein drinks, so it's only the strawberry that you can leave out at room temp and not worry about it tasting a bit odd! ), the promax bars are fab because they don't melt like normal chocolate bars do!! I need to start preparing my food in advance, like the night before at least, but I just don't have the time at the mo so will realistically not start till after we get back from the secret garden party at the end of July... and then, with the Maximuslce Body of 2009 competition deadline looming, I will be able to seriously focus on my nutrition over the following weeks. Chop the onion into small cubes, fry up with garlic and herbs with the olive oil. Keep stirring until the spinach has thawed and the mixture is boiling away nicely, then turn down the heat and allow to simmer for as long as poss for richness. Well done on the weight loss! I know what you mean about worrying about exercise on holiday. I'm doing exactly the same! Well done on the loss!! 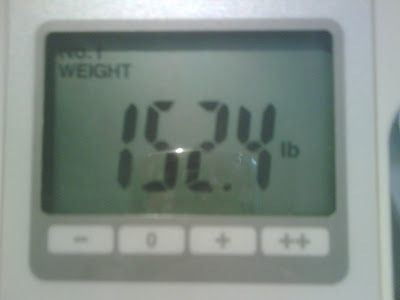 Yeah on the weight loss and reaching your first mile*stone*! such a small loss over the last few weeks but such a dramatic psychological hurdle to have overcome! Edna - hell yeah, I'm still stressing over the exercises I can do but I'm looking at the positives, like the fact that I can concentrate on things i've neglected, like stretching, running and my abdominals!!! yeah, I don't like that HBW thingy either, I only added it to the site as it was a free widget thingy and I'm a total geek!! I think I should replace both widgets with pics of buff birds to inspire me and spur me on! !